Any handyman or contractor can tell you, portable table saws are practically a necessity for many jobs in the field. But, for the uninitiated, it can be difficult to see what separates the best portable table saw for their needs from the seemingly endless options on the market. For many contractors, having a jobsite table saw is essential. If you're working on the job, rather than in a workshop, chances are you'll need a saw to perform large, rip cuts at scale. This is where the portable version of table saws are perfect. You can quickly (and safely) push out a wide array of cuts, including ripping wood and performing cross cuts. Read on as we take a closer look at the features to look for and provide our portable jobsite table saw reviews. Whether a hobbyist, woodworker, or professional, we've found a good model for you. Before we share our best rated ​mobile table saw, let’s discuss the features and attributes that can help you differentiate the different saws on the market. How stable the saw is affects every other attribute of the saw, and it can mean the difference between a job well done and a headache that costs you countless extra hours of work. Whether you’re looking for an affordable option to use around the house, or you’re a carpenter looking for the transportable table saw for fine woodworking, stability is of the utmost importance. The rip fence is an integral feature that allows you to make clean and precise cuts safely and easily. A quality fence that mounts securely and accurately to the table will make it easier to produce the perfect cut, every time. ​How your saw collects and deals with dust is an important consideration, especially if you’re working indoors. While nearly all saws offer a port for collecting sawdust that you can attach to your shop vac, some perform better than others. In general, if you’re worried about dust you’ll want to opt for the most substantial ​setup available for dealing with sawdust. Several factors affect the portability of a saw. Many of the top models include wheeled stands, while cheaper saws usually forgo this feature. If the saw doesn’t have wheels, you’ll want to make sure it’s light enough to comfortably carry to and from the job where you’re working. All saws are equipped with certain ​features for safety, such as a blade guard, a riving knife, and anti-kickback pawls. These features help to reduce kickback and offer additional protection for most cuts. Some cuts may require you to remove certain ​safety components, like the blade guard. These features are extremely important and should be used whenever possible. If necessary, they should also be easy to remove for certain cuts, and easy to re-attach. Depending on your needs, the power of the saw’s motor may be an important factor to consider. If you’re looking for a saw to handle light work around the house, a powerful motor probably won’t be very important. But, if you’re going to be using the saw regularly to tackle more difficult jobs, you’ll want to make sure the motor can provide the power you need. With tons of choices on the market at many different price points, you’re sure to find at least one saw that’s ideal for your needs and budget. We took some of the top rated table saws for a test drive, and here’s what we discovered. 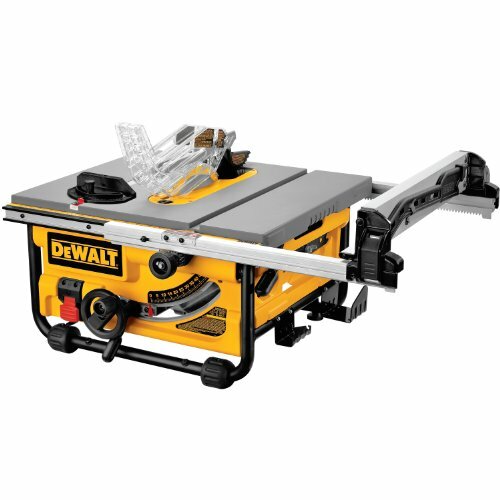 If you’re looking for ​one of the top mobile table saws for the money, this model from DeWalt is worth a closer look. Despite its moderate price, the Dewalt Compact Saw includes many of the features found on their more expensive saws, including Dewalt’s rack and pinion fence system. The fence is simple to adjust and allows for perfectly accurate cuts, and it’s also among the most secure available. A 15 amp 1,850-watt motor provides enough power to tackle most jobs. Serious professionals may find this a lacking i​power tool, but at this price the power Dewalt offers is hard to beat. At only 45 pounds, this saw picks up and moves anywhere you need with ease. The heavy-duty roll cage offers increased durability which is a must for busy job sites. It also makes the saw easy to carry. As for safety, this saw offers all the features you could ask for. It also includes a tool-less blade guard, which makes it easy to remove or re-attach the guard in seconds. One thing you’ll quickly notice is that this saw doesn’t include a stand. You’ll want to invest in a stand before using the saw. But, the fact that it doesn’t include one allows you the freedom to choose whichever stand you like. While the DW745 has an amply sized dust port, it does tend to clog. While some people won’t have an issue with this, it can be a problem, especially if you work indoors. Despite its low price, the Ms20 includes several accessories in the box. In addition to the saw itself, you get an MS50 side cutting blade, four MS51 wood & plastic blades, four MS52 fine wood blades, an MS53 metal blade, and a vacuum adapter. 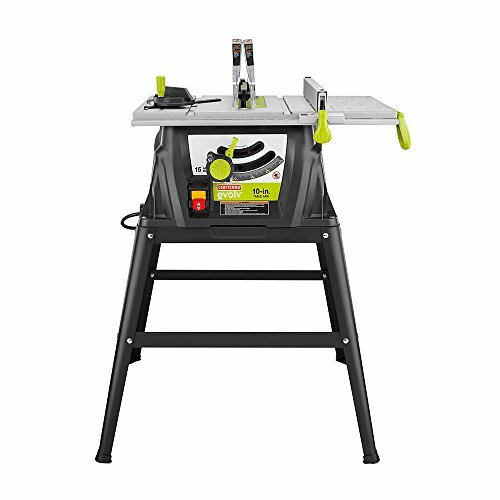 Thanks to its impressive range of features, it’s easy to be surprised by the entry-level price of this Evolv Saw by Craftsman. Like the Dewalt DW745, the Evolv features a 15 amp motor. However, it’s capable of 5,000 rpm, which is 1,250 more than the DW745. Despite its position as an entry-level tool, the Evolv does offer sufficient power for nearly any job around the house. The Evolv is also lightweight and weighs in at just over 50 pounds with the stand. Since the stand is a permanent fixture, moving the saw can be a bit cumbersome, despite its light weight. The rip capacity on this Craftsman is 9" on the left and 13.5" on the right. That is a lot less that the similarly-priced Dewalt that we reviewed above. The safety ​components of this saw are comparable to other saws on the market. However, they aren’t quite as easy to adjust or remove as the safety portions on more expensive saws. While this saw offers ample opportunities to make fine adjustments, it isn’t as precise as more expensive saws. However, it’s certainly precise enough to tackle nearly any job around the house. For woodworking and contracting professionals, you may want to look towards a more expensive model. One thing worth considering, especially if you work indoors often, is that the dust collection capabilities of this saw are practically non-existent. It doesn’t feature the same kind of port design for collecting dust that other saws have. Craftsman doesn’t manufacture any accessories to aid in ​this either. Arguably the best portable table saw in its price range, the 3410-02 from Skil provides intuitive features that every user is sure to appreciate. Compared to the Craftsman and Dewalt we just discussed, the Skil Portable Saw offers the largest depth of cut and an aluminum table. The other two offer cheaper plastic tables. The self-aligning fence helps save time without sacrificing precision. It also helps you make accurate and precise cuts quickly and easily, without having to fumble with adjustments before making your cut. You'll also find an included miter gauge. Despite its heavy duty construction, this saw is exceptionally light at just 45 pounds. The included stand folds up to make transporting a breeze. It’s also quite easy to assemble, and you’ll be ready to go right out of the box in about a half hour. This SKIL has a rip capacity of 12" on the left and a whopping 24" on the right, after extending the table. 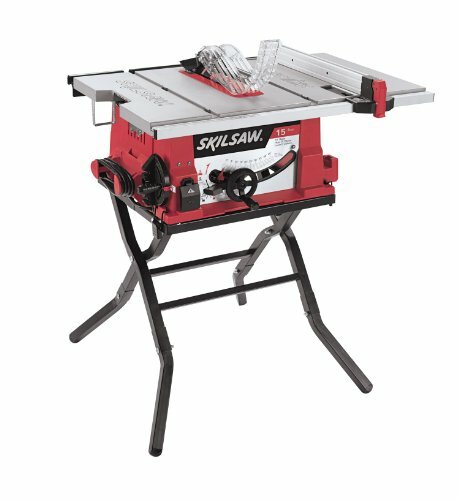 Compared to cheaper mobile saws that we reviewed above, this gives you a much wide range of rip cuts that you can make. Although this saw does feature high quality materials throughout, vibration is a slight issue with this model, and it can result in slightly ​lower accuracy in your final cuts. If you’re in the market for ​a really accurate table saw for woodworking, you may want to look elsewhere. But, for most applications, this saw is tough to beat. Also, while this saw includes all the standard safety features you’d expect, the safety switch doesn’t seem as secure as some others. It is possible to turn the saw on or off by accident. For those looking for a heavy duty saw that could tackle any job with ease, the Bosch 4100-09 is a saw worth taking a closer look at. This saw is packed with innovative features that make it easy to produce perfect results. The robust build and quality offers a level of stability few other saws can compete with. The 4100-09 features Bosch’s Constant Response Circuitry which ensures the motor keeps its speed regardless of load. This feature allows the saw to make quick and clean cuts in any material. Despite the fact the motor is smaller than cheaper models, like the Skil and Craftsman saws above, this motor performs consistently. At 60 pounds, this is the heaviest saw we’ve discussed. Despite the weight, it’s the easiest saw to maneuver and store thanks to its large pneumatic wheels and innovative gravity rise stand. ​This is the top moveable table saw stand we've found. The gravity rise stand also features heavy duty construction that provides an unrivaled level of stability. Additionally, included are a rip fence and miter gauge. 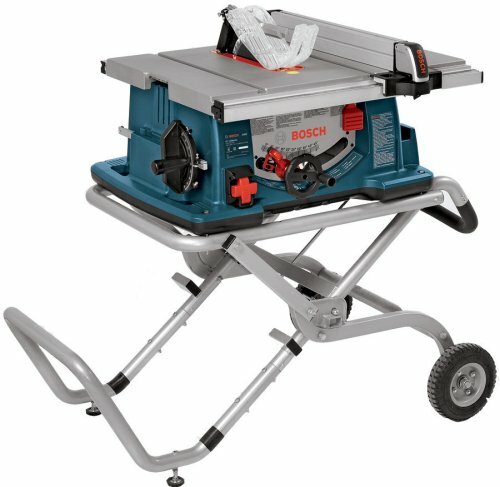 This Bosch features a rip capacity of 8.5" in the left and 25" to the right. Similar to the SKIL listed above, but without quite as much distance play on the left, the 4100-09 gives you adequate rip cutting range in the field. You’ll want to consider using a shop vac with this model, even if you’re ​cutting outdoors. The motor housing is extremely well vented, but that also leaves the motor vulnerable to dust getting into the housing. Some people who have owned this saw in the past have had issues with the motor reversing polarity, which is a major flaw. This is something Bosch has apparently addressed with newer models, so it shouldn't be an issue. But, if you’re considering buying this saw used, it’s worth considering. Compared to other models, this Bosch features a high level of accuracy that’s sure to delight fine woodworkers and professional contractors. ​When you're looking for one of the top rated mobile and transportable table saws, you’ll find at least one saw to fit your needs with our reviews above. Overall, the Bosch 4100-09 shines when it comes to portability, accuracy, and its ability to tackle any job with ease. But, if you’re looking for an economic option, the 3410-02 from Skil may be a great choice for you. Regardless of your needs and budget, buying an ​easy-to-move and transportable power saw can be a major purchase. Carefully consider all of the features and benefits each saw provides before deciding on which saw to buy.